Cut the jacket potatoes lengthways in half and scoop out the potato leaving about half a cm with the skin (you can use the potato for another recipe). Then lay the skins on a baking sheet. Place the macaroni and milk in a saucepan over a medium heat and bring to the boil. Reduce the heat and gently simmer for 7-10 minutes stirring occasionally until it thickens up. Remove from the heat and stir in the French's Classic Yellow Mustard, half the cheese and the spring onions. 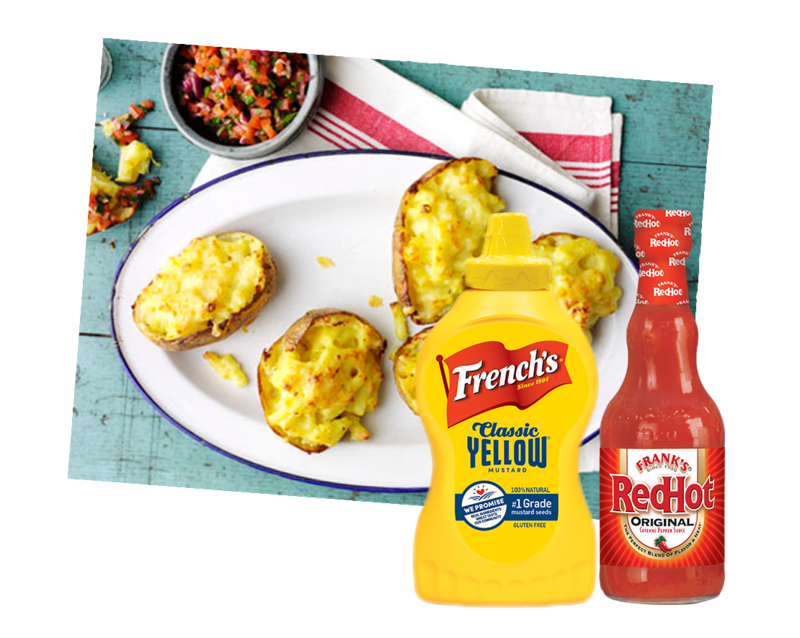 Spoon the macaroni cheese into the potato skins and scatter over the remaining cheese. Bake on 200°C for 15-20 minutes until golden and crisp. To make the salsa, combine the tomatoes with the onion, parsley, Frank's RedHot Original Cayenne Pepper Sauce and serve alongside the skins.